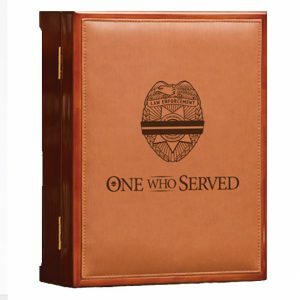 One Who Served, Law Enforcement volume alone is designed as a gift to be presented to a family when they lose a loved one who serves or has served in Law Enforcement. It is a resource to help them through the bereavement period as well as a keepsake service. In these pages they can memorialize their loved one, and record special thoughts and learn how better to cope with grief. The final section provides resources for help. 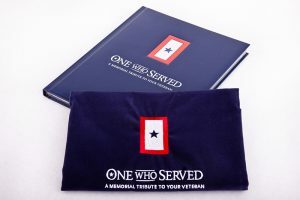 A unique and memorable way for companies to recognize any colleague, or their family members, that have served in the armed forces. A lasting message of care and concern to America's fallen hero's. 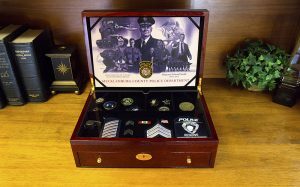 Our mission is to offer the families of Law Enforcement a customizable and interactive way to display the symbols of one’s career in a highly dignified manner. Unlike shadowboxes and other display products, the superior design and craftsmanship of our keepsake chest is constructed to allow one to easily exhibit different pieces at different times as well as to exhibit artwork especially commissioned for this project. 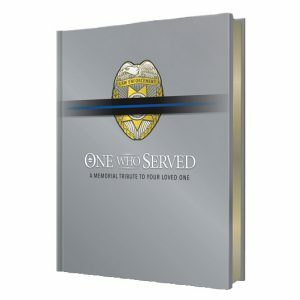 It is conceived specifically as a gift to pay tribute to the service of one in active duty or a Law Enforcement retiree. The elegant, high gloss finish, sturdy hinge design, matching classic drawer handles and overall workmanship of our chest is evident. Unlike other traditional gestures, the One Who Served keepsake chest may be displayed any-where in the house and easily moved from one place to another. The top drawer can be completely customized with two handy pin boards that easily conform to the interior of the chest, a sectional divider and a clear, protective panel. The bottom drawer may even display the service weapon among other pieces symbolic of a career in Law Enforcement. It also has two handy pin boards, a locking feature for safety, as well as a clear cover panel for protection. The polished finish of the Legacy chest is an elegant, furniture-quality keepsake chest in honor thoughtful consideration your company has for the service of our veterans. 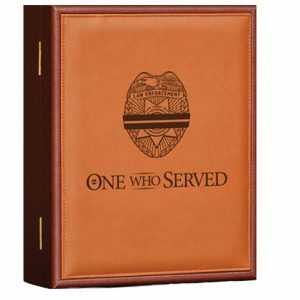 The hand-crafted workmanship and personalized inscription insure your company that this memorial tribute will not be duplicated. 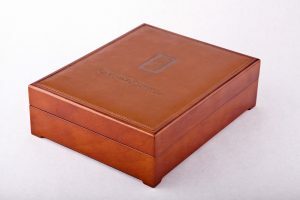 The Signature chest, provides the family with a leatherette covered, hard-wood chest and offers the same keepsake compartment to present the book and house treasured mementos, photos and personal items. For the ultimate gift, present One Who Served in one of our two beautiful keepsake chests. Done in a piano finish wood trim, or burgundy leatherette style, our wood chest includes a personalized insert with your special message to the family. We create the insert here at our company per your exact specifications. Complete with a felt back to protect furniture, full blue liner and hidden magnetic catches, either wood chest is the perfect way to present and protect the volume. Finally, we include a keepsake compartment under the book in order to store personal mementos, medals, certificates, etc. A number of years ago, a couple of veterans had the idea of creating a memorial volume written specifically for the families of veterans. 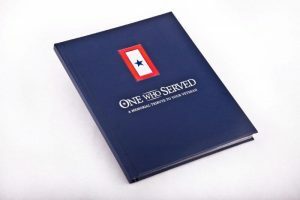 This book would be presented as a gift and keepsake for the family when their veteran passed away. The book was written to celebrate military service, recognize the family, define the grieving process and provide resources for assistance. It would explain to the recipients not so much what all of us did as members of the Armed Forces, but more importantly, why we did it. That volume is now a reality. It is entitled One Who Served, A Memorial Tribute To Your Veteran. For the ultimate gift, present One Who Served in one of our two beautiful keepsake chests. 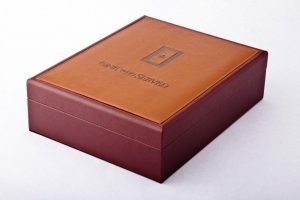 Done in a piano finish wood trim, or burgundy leatherette style, our chests include a personalized insert with your special message to the family. We create the insert here at our company per your exact specifications. Complete with a felt back to protect furniture, full blue liner and hidden magnetic catches, either chest is the perfect way to present and protect the volume. Finally, we include a keepsake compartment under the book in order to store personal mementos, medals, certificates, etc.